Makeup and personal care items are among the most difficult vegan products to purchase because these items don’t necessarily have to have their ingredients listed on their packaging. From brushes to sponges to lotions and pigmented products for your face, there are so many beauty products that use animal products without logic or reason. Things you wouldn’t expect to be non-vegan, like makeup brushes, lip balm, nail polish, or eyeshadow, can contain hidden animal products like animal glue to hold the brush’s bristles in place or crushed fish scales to add sparkle. On top of that, beauty box services like Birchbox and Ipsy are alluring but ultimately a massive disappointment for vegans. Though they’re trendy and include makeup from some of the most popular brands, most of these popular box subscription services are not vegan-friendly. They either don’t label their products as vegan or explicitly decline to cater to vegan lifestyle preferences. However, if you love makeup and are enthralled by the idea of getting new makeup or beauty product samples delivered to your home on a regular basis but aren’t sure whether there are any options that are compatible with your vegan lifestyle, you’re in luck. We’re going to review a variety of different beauty box options for vegans, including some options that are often described as vegan but may not actually be what they seem. After reading this list, you’ll have a better idea of what beauty box subscription options are best for your budget and for your peace of mind when it comes to vegan values. The Vegan Cuts Beauty and Vegan Cuts Makeup Boxes are brought to you by the same company that makes the Vegan Cuts Snack Box. If you like those snack boxes, you may be particularly interested in their separate subscription and gift box options for beauty products and makeup. The two categories cover different items, though the terminology might be a little confusing since makeup is often lumped into the “beauty products” category. The Vegan Cuts Beauty Box does often include makeup items like vegan nail polish or vegan lipstick, but not in as high a volume as the Vegan Cuts Makeup Box does. That’s because the Vegan Cuts Beauty Box will also include other vegan cosmetic and personal care items like lotion, bath soaks, face masks and even tools like vegan sponges. The makeup box includes makeup products only, ranging from simple classics like neutral-toned eyeshadow to on-trend items like a strobing highlighter. In addition to being vegan, all the products in both the subscription beauty boxes from Vegan Cuts are cruelty-free and focus on the use of all-natural, paraben-free ingredients. Aside from offering different types of products, the Vegan Cuts Beauty Box and Vegan Cuts Makeup Box differ in some additional fundamental ways. They don’t deliver on the same schedule, don’t include the same product sizes and have different methods of product selection to determine what goes into each box. This means that if you really love one of the boxes, you may want to consider subscribing to the other so you can multiply the number of fun vegan personal care or beauty products you receive. The Vegan Cuts Makeup Box includes four full-size makeup products that are customized by shade based on the Beauty Profile Quiz you’ll fill out as part of your purchase process. Brands like Pacifica and Emani Vegan Cosmetics are featured, and if you like the full-size products you receive enough to buy them again, you may be able to purchase them at a discount in Vegan Cuts’ online store. The Vegan Cuts Beauty Box includes 4-7 products that may either be full size or “deluxe sample” size, meaning you’ll get more than one use out of the samples. You won’t get to customize your deliveries with a profile quiz for the Beauty Box, but its lower price point may make this sacrifice more tolerable if you decide to go with this option over the Makeup Box. The Beauty Box may include products from companies like Lush and Zoe Organics. Many of the Beauty Box products will also be available for discounted purchase in the Vegan Cuts online store, which can be nice if you end up really liking a sample. The Makeup Box is available quarterly, meaning it ships four times a year, and the Beauty Box is available monthly. Some beauty and personal care focused gift boxes available if you’d like a one-time delivery. There are no add-on options or additional sizes to choose from for either of the Vegan Cuts beauty boxes. Like the Snack Box, the monthly Beauty Box offers both an auto-renew monthly billing option and a pay-as-you-go prepaid subscription option. Having the option to avoid auto-renew may help give this box the edge over some competitors. Though the Makeup Box delivers quarterly, it too has an option to avoid auto-renew. You can either sign up for an annual subscription, meaning you’re purchasing four boxes (which will then be sent to you quarterly throughout the next year) up front or a quarterly subscription, which will auto-renew. Vegan Cuts doesn’t offer refunds for either of these boxes. You can cancel anytime if you’re on an auto-renew plan. Prices are listed in US dollars. Vegan Cuts ships its Beauty and Makeup boxes to the U.S., Canada and international locations beyond. There are shipping price options for each location, so be sure to select the correct option as you check out. Manufactured by actress Jessica Alba’s Honest Company, the Honest Beauty line seems potentially promising for vegans but may fail to actually deliver truly vegan products. Here’s what we’ve been able to find; you can use this information to decide whether this box option sounds good enough to mesh with your ethics. To start, PETA has certified Honest Beauty as a cruelty-free company and included Alba on a list of “10 Celebrity Beauties Leading by (Cruelty-Free) Example.” However, beyond being cruelty-free, PETA does not describe Honest Beauty as a vegan company. The organization does use “vegan” as a designation separate from “cruelty-free;” whether you think non-vegan products can actually be cruelty-free is another matter. PETA doesn’t seem to think they go hand in hand, and it’s significant that they don’t describe Honest Beauty as being vegan. Additionally, Honest Beauty itself doesn’t describe its products as vegan. It will say things like “not tested on animals” and “no animal by-products,” but that doesn’t make for a vegan product. This is all worth mentioning because some sources have Honest Beauty Bundles listed as part of a collection of vegan beauty box subscription options, but from what we’ve been able to find, it really doesn’t seem that Honest Beauty is a vegan company. Vegetarians may be comfortable with the level of reassurance the company provides, but by-the-book vegans will probably not want to try their luck with a company that’s gotten in trouble multiple times for being dishonest. The standard Honest Beauty Bundle box includes three full-size Honest Beauty products. You choose what comes in your box; there’s a set list you can choose from to customize your subscription. This list may not include all of Honest Beauty’s products, but it’s a great option for those products you tend to use a lot of. The same products will arrive in each box until you make changes. Three items are the only standard box size options, but you can add additional products from a limited list of options for a total of up to eight items per delivery box. This means you can further customize your box beyond the standard three products. Many of the add-on products are special items like beauty tools, makeup cases, travel-size product sets or palettes with smaller individual product sizes but more color options. Honest Beauty Bundles have a default delivery frequency of once a month, but you can change this or cancel your subscription online. Your Honest Beauty Bundle subscription will bill automatically through payment info stored to your online account. You can buy any of the items in your bundle separately through the Honest Beauty store, though the company says that you can save “up to 50%” on their products by purchasing a bundle. Prices are listed in US dollars. If the concept of eco-friendly, healthy, all-natural, non-toxic, cruelty-free vegan products with a social conscience sound good to you, you’ll probably love the Love Goodly subscription box. Featuring famous beauty brands like Kat Von D and Juice Beauty, this box is the perfect blend of practical and fun, though it may not be for you if you want a purely by-the-book beauty box that focuses solely on makeup and personal care items. As a company, Love Goodly seems dedicated to the vegan mission with a focus on charitable donations (they donate a part of each box’s proceeds to a charitable cause), ethical manufacturing (they favor handmade and Made in USA products), sustainability and other important causes. The Love Goodly website does have some bugs, including persistent popup windows offering a small discount on your first box if you add your email to their newsletter list, but overall, the experience of subscribing to and managing this box is simple. As of July 2017, Love Goodly doesn’t offer any box customization through a profile quiz, though the company says they plan to add this feature. As a result, most of their makeup isn’t tailored to a specific skin tone, though there still may be some products that aren’t compatible with your needs. You can preview what’s supposed to be in the box and decide whether you’re happy with that delivery’s contents. You’ll get about 5 or so full-size or deluxe sample size (more than 1 use per package) vegan makeup, personal care or pampering items in the Love Goodly box. The company seems to include a reliable mix of at least one makeup product, plus some kind of beauty or hair tool and a few goodies. These extra items can be everything from chocolate to jewelry to tea. You may also get some supplements, skin care oils or all-natural vegan beverages in your box as well. All of Love Goodly’s box packaging is recycled. The Love Goodly beauty box is available in only one size and one delivery speed: Bimonthly. That means you’ll get a box delivered every other month. There’s no way to expedite processing, but you can pay extra for priority shipping if you just can’t wait to get your hands on your next Love Goodly box. You can purchase a one-off gift box if you’d like. You can either get this for someone else or use it as a trial to see how much you like Love Goodly’s subscription service. The Love Goodly vegan beauty delivery box is available as an auto-renew subscription, which you’ll pay for on their website. They offer both cancellation and the option to pause your box for a delivery cycle if you’re not feeling it or need to save your pennies for something else. The pause option is a good idea if there’s an upcoming delivery that includes something you know you won’t use. If you choose to cancel, make sure you receive official confirmation from Love Goodly. Love Goodly offers free shipping inside the continental US plus shipping to Alaska, Hawaii, outlying US territories and Puerto Rico. Canadians can also get in on the fun, though, as with other customers outside the continental US, additional shipping fees may apply. Prices are listed in US dollars. Having been hailed by the likes of Vogue magazine, you’d expect the vegan beauty subscription box from Petit Vour to be prohibitively expensive. Luckily, that’s not the case. This budget-friendly box offers a great way for cruelty-free vegans to try out some new beauty products. Petit Vour’s selection runs the gamut from fragrances to cleansers and makeup items. Bath soaks, face masks, makeup remover, lipstick, makeup brushes and more await, all with a 100% vegan, cruelty-free, non-toxic focus. Petit Vour offers customization through a beauty profile, and you’ll also earn points to use in their online store for every box you receive. This makes Petit Vour structurally pretty similar to Birchbox, a popular but not vegan beauty subscription box. You can use your accumulated points to get discounts on full-size versions of products you enjoyed in your Petit Vour vegan beauty box. If you save up enough points, you may even be able to get some top-dollar products at a steep discount or even for free. That may make the box well worth it over time, even if you occasionally end up with the odd product you’re not wild about. The relatively low price point and ability to redeem points can make a few misses worth it, especially as you’ll likely end up finding a few hits that make it easy to stick to a vegan lifestyle and keep up the kind of hair, body, and skin care and makeup routines you prefer. Overall, the service Petit Vour offers is simple, straightforward and appealing in its ability to balance frugality with luxury and a little bit of the “treat yourself” ethos without making any compromises on veganism. Petit Vour is the kind of company that proves modern vegans are a more diverse bunch than the stereotypical Birkenstock wearing hippies (not that there’s anything wrong with that). The brand image Petit Vour Projects is one of style and luxury, something more in line with the aesthetic of an “urban fashionista” who just happens to be a strict, uncompromising vegan. The Petit Vour box includes four products. Most are deluxe sample sizes, so you’ll get more than one use from most products, but they may occasionally swap out a sample for a full-size product. There’s only one size and delivery speed available for the Petit Vour vegan beauty box delivery. You’ll get the four-product box delivered monthly when you sign up for a recurring plan. The box the products arrive in is small enough to fit most mailboxes, though perhaps not in a small apartment mail slot. As a monthly delivery, the Petit Vour box is available in either month-to-month or recurring. Prices are listed in US dollars. The month-to-month option isn’t exactly unique, but it’s a refreshing change of pace from strict subscription box services that don’t offer flexibility in their billing. If you’re the type to forget about a monthly subscription, the month-to-month option may be your best bet for avoiding billing issues or getting into a cycle of needing to cancel but forgetting to do so. You can have your Petit Vour box shipped to the US, Canada or an international destination, though different pricing tiers apply to each option. Petit Vour is based in the US, so boxes that ship on their home turf are priced lower than those shipping to international destinations, but the cost is still relatively low, especially if you’re living in a country with very few vegan or cruelty-free options. Want a nice assortment of cruelty-free, organic vegan beauty products to enjoy every other month? The Vegan Beauty Box may be a great option for you. This Australia-based company offers snack boxes as well, but if you’re after vegan beauty products in specific, the Vegan Beauty Box is a great choice. 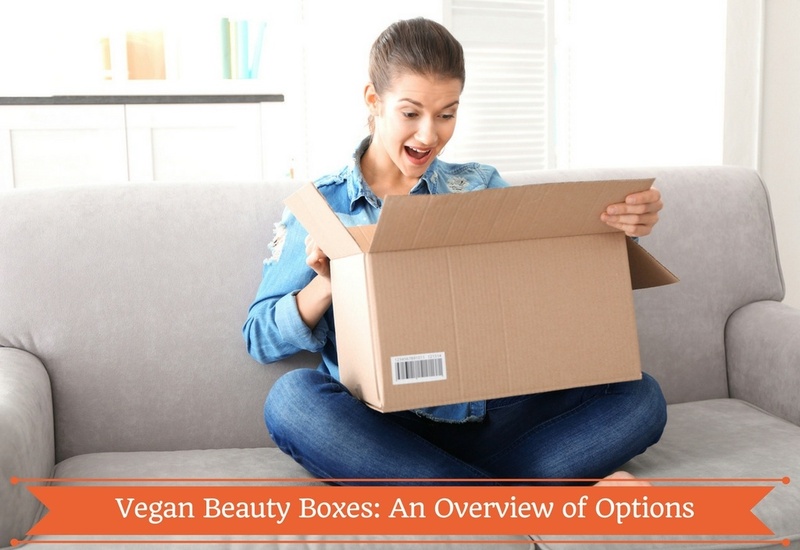 The Vegan Beauty Box offers great products and provides good value for the price, but there’s nothing spectacular in its approach that makes it dramatically different from other options in this category. If you live in Australia, New Zealand or another location that’s closer to that part of the world than it is to the USA, subscribing to the Vegan Beauty Box makes good sense. If you live in the US, Canada, the UK or another nation that’s not so close to Australia, though, it’s probably more sensible to go with a service that’s closer to home. There are between 5-8 products included in each Vegan Beauty Box delivery. The products can be in travel, sample, and full sizes, so you’ll get a nice mix with each delivery. The Vegan Beauty Box is a bimonthly box delivered in February, April, June, August, October, and December. The company sends out the boxes within the first week of the month, so you should get your delivery soon after depending on how far away from Australia you are. This fun box bills on an auto-renew subscription plan that draws from your stored billing information every second month. You can cancel, but you’ll need to do so at least 24 hours before the payment processing date. The Vegan Beauty Box Company doesn’t offer refunds for payments that have already been processed. Prices and product values are listed in Australian dollars. The Vegan Beauty Box ships within Australia and to international locations beyond. You can add tracking services to international orders for an additional fee. Vegan beauty mavens living in the UK will love the Vegan Kind, a beauty box subscription service that offers fantastic vegan beauty products with a conscience. A small portion of the proceeds from each month’s box is donated to a charity of the company’s choice, and the charity selection usually rotates from month to month. The Vegan Kind also offers a Lifestyle Box with snacks and other fun items, but the beauty box is a good choice if you want to try a variety of different personal care and pampering items every month. This company is a great resource for vegans in the UK. Based in Glasgow, the Vegan Kind has an online vegan supermarket in addition to their subscription boxes. This online supermarket offers some perishable goods like fresh-baked vegan pastries and chilled vegan cheeses. The samples and full-size products included in each Beauty Box from the Vegan Kind are chosen by the company’s staff; there are no customization options or personal profiles to determine makeup product preferences. They also can’t cater to allergies and dietary/lifestyle preferences beyond guaranteeing that all their products are vegan. The Vegan Kind Beauty Box includes about five products, sometimes with more and usually not with less. These products can be full size, deluxe sample size or single-use; there’s typically a mix of all three sizes in a single box. You may receive beauty and personal care items ranging from a deluxe exfoliant polish sample to a vegan makeup brush and a full tube of mascara along with fun lifestyle stuff like incense sticks and an incense holder. There’s only one box delivery option and there’s only one box size available. The Vegan Kind Beauty Box ships quarterly, so you can get up to four boxes a year. If you’re interested in more boxes, you can purchase past boxes as a one-off without subscribing. You can sign up for a three-month, six-month or full-year subscription, all of which bill on a recurring auto-renew basis. You can cancel at any time and are not subject to a minimum subscription period. Though the Vegan Kind’s lifestyle box ships internationally, the Beauty Box is currently available in the UK only.